Howard Schultz, the executive chairman of the global coffee giant Starbucks, announced on Monday that he will be leaving the company at the end of the month, and he said running for public office is one possible next step. Schultz, who helped turn a local Seattle coffee chain into a worldwide brand with more than 28,000 stores in 77 countries, said that he had privately outlined a plan to the board of directors a year ago about his exit from the company, the New York Times reports. He went on to say that he would have announced his departure last month, but it was delayed after the company came under fire when an employee called the police to arrest two black men in a Philadelphia Starbucks after they didn't order anything while waiting for a friend. He is frequently mentioned as a potential candidate for the Democratic Party and has become increasingly vocal on political issues, including criticizing President Trump last year as "a president that is creating episodic chaos every day." While Mr. Schultz, 64, typically bats away speculation about his political ambitions with an eye roll or a pithy answer, on Monday he acknowledged for the first time that it is something he may consider. "I want to be truthful with you without creating more speculative headlines," he told The New York Times. "For some time now, I have been deeply concerned about our country — the growing division at home and our standing in the world." "One of the things I want to do in my next chapter is to figure out if there is a role I can play in giving back," he continued. "I’m not exactly sure what that means yet." When he was asked specifically about a presidential run, he responded: "I intend to think about a range of options, and that could include public service. But I’m a long way from making any decisions about the future." After Donald Trump, a former real estate developer and reality-television star, got into politics and won the presidential election in 2016, business leaders began eyeing a potential presidential bid in 2020. Some of the business leaders included JPMorgan Chase's chief executive Jamie Dimon, billionaire NBA team owner Mark Cuban, and Disney CEO Robert Iger, who has since backed off political ambitions following the 21st Century Fox deal. 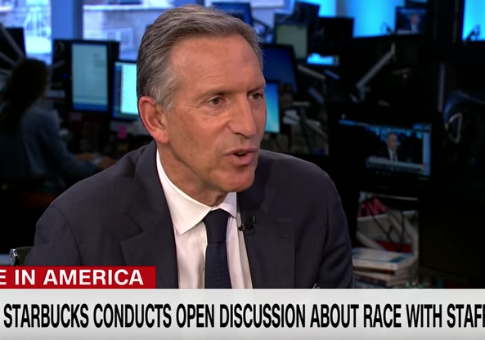 Starbucks has not shied away from social issues during Schultz's tenure, and that has included gay rights, race relations, and gun violence. He has also said he seeks to maintain a "balance between profit and conscience" in his leadership, arguing there are many ways to serve the country besides running for office. "I want to be of service to our country, but that doesn’t mean I need to run for public office to accomplish that," he said. This entry was posted in Politics and tagged 2020 Election, Donald Trump, Mark Cuban. Bookmark the permalink.